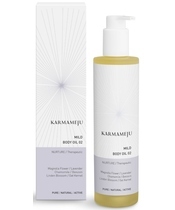 MILD Body Oil 02 is a really delicious body oil from the Danish brand Karmameju. K ropsolie specially developed for delicate and sensitive skin type. It is enriched with pure, organic olive and jojoba oil that nourishes and strength to the skin. It is with lavender and chamomile as a calming and relaxing the body and mind. Dildfrøolien eases nausea, colic and pms pain. MILD Body Oil 02 is also good for preventing stretch marks during pregnancy. Oil mild form makes it suitable for everyday use.